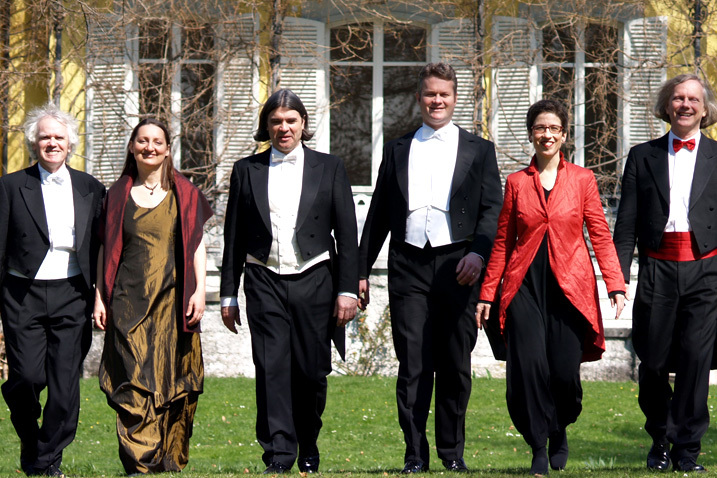 Cantus Cölln The soloist vocal ensemble was formed in 1987 by the renowned lutenist Konrad Junghänel. In just a few years it managed to become one of the best vocal ensembles in the world. The core of its musical efforts includes the German and Italian vocal literature of the Renaissance and the Baroque. Cantus Cölln’s inclusion in its repertoire of pieces from the superb German tradition of these eras, musical traditions that have been rather neglected, has received wide acclaim from the public. The about 30 recorded CDs, which cover a repertory from Monteverdi madrigals, his Vespro della beata Vergine, Schütz’ Psalms of David up to motets and cantatas of Johann Sebastian Bach have almost all been rewarded with international prizes. Next to numerous awards/ distinctions like such as the Edison Awards Classical, the Diapason d’Or, ffff du Télérama, 10 du Répertoire, the Choc du Monde de la Musique, the Grand Prix du Disque (Académie Charles Cros) and nominies for among others the Grammy and the Grammophone Award Cantus Cölln was awarded the Grammophone Award just as the Jahrespreis der deutschen Schallplattenkritik and the Caecilia Price for its singular recording of Monteverdi’s Selva morale e spirituale in 2002 and the ECHO Klassik for its recording of the complete Altbachisches Archiv in 2004. Critics continually emphasize the fact that the singers, of whom each has a successful solo career, impress the audience with their nearly flawless homogeneous ensemble sound, without however, losing their individual vocal timbre. From the very beginning on Cantus Cölln aimed to reach an increasing homogenity, a “blind” musical understanding through an hardly ever changing composition of the group. For an international string quartet this should be taken for granted but unfortunately it is very often missing in the generally fast changing music market. But at Cantus Cölln most of the today’s members are still the ones that founded the ensemble. The ensemble is occasionally augmented for the performance of sacred music calling for larger forces such as the cantatas and motets by Bach, Psalmen Davids by Schütz and the Vespers by Rosenmüller. During the years the repertory has spread from its early focal point “Madrigals and Motets” of the 17th century to the complete development of sacred concerts and the cantata up to high Baroque. Important criterion when choosing a programme is of course that the concerned piece of music must be suitable for the soloist way of performing – whether it gains more through it then it might lose. It is not about the “one and only” way of performing but about following a sound that fuses highest transparency possible with individual emotion and sensual sound. Among the outstanding highlights during the development of the years were the productions of the Vespro della beata Vergine of Claudio Monteverdi and the one of Johann Rosenmüller which marked the beginning of a small international Renaissance of this important “German-Italien” composer. Further the productions of motets, early cantatas and the Mass in b minor of Johann Sebastian Bach met with an enthousiastic international echo. Already now the early cantatas – awarded with many prestigious prizes – belong to one of the most successful Bach-cantatas-recordings ever. A new stage production is in preparation. The first staged production of Cantus Cölln – „Combattimenti“ with madrigals of Monteverdi – was a coproduction between the Nationale Reisopera in the Netherlands and the Théâtre Transparant in Belgium. After the big success of the production in 1998 Cantus Cölln did a second tour in January 2000. The well-known French CD-magazine “Diapason” characterised Cantus Cölln as “one of the revelations over the last few years in the domain of ancient music”. In the year 2000 Cantus Cölln was awarded the much sought after Buxtehude prize of Hanse town Lübeck for its extraordinary achievements on the field of sacred music. Last prize winner was Elliot Gardiner in 1994. Cantus Cölln achieved its reputation through numerous performances at international festivals in Europe (Herne, Stuttgart, Utrecht, Innsbruck, Schleswig-Holstein, Salzburg, Barcelona, Breslau, etc. ), and invitations to perform in North and South America, Africa, Australia and Asia. Broadcast recordings and long term regular recording plans – first with Deutsche Harmonia Mundi-BMG, then with Harmonia Mundi France – help to confirm the international renommée of this ensemble. Currently, Cantus Cölln collaborates with the label Accent, Heidelberg. Konrad Junghänel Konrad Junghänel is one of the leading conductors in the field of Early Music. He began his career as internationally renowned lutenist. Since the period of his studies in Cologne he has regularly collaborated as an instrumentalist with René Jacobs – for recitals and opera productions – and other well-known ensembles such as Les Arts Florissants, La Petite Bande or Musica Antiqua Köln, being praised for his extraordinary virtuosity.